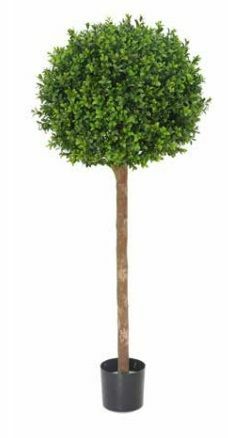 Natural wood stemmed artificial topiary trees, excellent as smart sentinals, in pairs and porches. The artificial Topiary Buxus Ball Tree leaf gives a lesser tightly trimmed appearance than the boxwood leaf. Approx. diameter of ball at widest point is 58cm. Ideal for indoor and great for outdoor use. Product Image and Planter Information: The planter in the picture is for illustration purposes only. Need to buy a Planter, pot or trough? Click here to shop for all our Planter and container types.